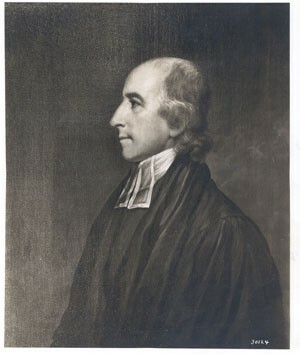 Following the sudden departure of President Myles Cooper, the Board of Governors, with Cooper's recommendation, appointed King's College graduate Reverend Benjamin Moore ('68 KC) president pro tempore. Despite the upheaval in New York and the colonies Moore continued to hold classes for two more years, even admitting a new class in 1775. While the arrival of American troops in New York City on April 14, 1776 forced the College to officially close and disperse, two months later, Moore gathered his students at the Wall Street home of one of the members of the Board of Governors and continued to provide instruction, even filing the annual call for matriculants during the summer of 1777, to which at least two boys responded. NOTE: In 1776, instruction was suspended for the American Revolution. When classes resumed in 1784, the name Columbia College was adopted; the College was governed by a Board of Regents until 1787. Click here for information on Benjamin Moore's second term.